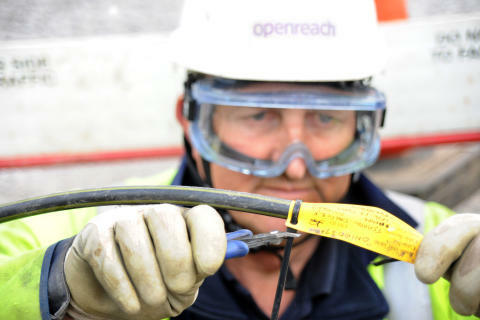 The West Midlands is expected to get a multi-million pound boost from an initiative which sees local communities forming partnerships with Openreach to bring high-speed fibre broadband to rural homes and businesses. An independent study published today estimates that Openreach’s Community Fibre Partnerships (CFP) programme will be worth £17.5 million to the region over the next 15 years. Across the UK more than 500 communities have already signed up to the CFP programme, of which around 50 are in the West Midlands. They include projects in rural communities such as Cotwalton near Stone in Staffordshire, Dodford and Pershore in Worcestershire, Little Wenlock in Shropshire, Ullenhall in Warwickshire, as well as in Hereford, Aldridge, Kingswinford and Sutton Coldfield. For West Midlands businesses, improvements in productivity, efficiency, flexible working, innovation and finding new markets and customers are expected to be worth nearly £6 million; whilst households get economic and social benefits worth more than £10 million. Just over 400 Community Fibre Partnerships were signed at the time of writing the report and therefore all figures are calculated on this number. The benefits will therefore increase as more partnerships are signed. The financial impact of Community Fibre Partnerships is calculated in this report as a Gross Value Added (GVA) contribution. Gross Value Added (GVA) measures the value of all goods and services produced in an economy. Growing GVA can reflect improvements in workforce skills, productivity, R&D and innovation. The figures in this announcement show the value added directly through Openreach's services as a result of Community Fibre Partnerships. Regeneris Consulting is an independent economics consultancy that provides research-based advice to major corporates, developers, national Government bodies and local Government. Regeneris specialises in preparing robust assessments of economic impact, focusing on the impact of new technology, physical developments, policy changes, investment programmes and corporate economic footprint. Regeneris work across the UK from their offices in London and Manchester. See: www.regeneris.co.uk for further information.